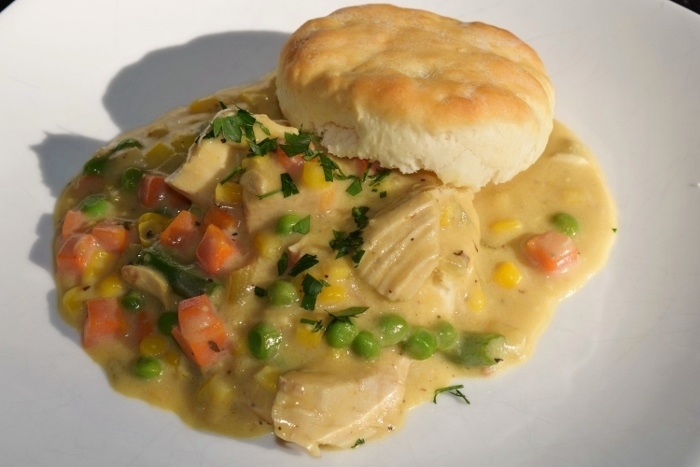 This easy chicken pot pie makes a wonderfully quick weeknight meal. You can take some shortcuts by using leftover chicken (about 2 cups) instead of cooking a chicken breast. Just put the soups, water and herbs in the skillet, mix well and heat until it begins to bubble. Then add the chicken. You could even use canned mixed veggies if you want but I think the frozen taste much better. If you're like me and like to be a little different, instead of using the “normal” frozen veggies (peas, corn, carrots and green beans), try a combination of broccoli, cauliflower and carrots! However you choose to do it, I think you're gonna like this homemade, inside out chicken pot pie! Cut chicken breast in half across the bone. Sprinkle both sides of chicken breast with salt and pepper. Set aside. Heat large skillet over medium high heat. Add Olive Oil. Place chicken pieces skin side down in skillet. Turn to brown all sides. In a medium bowl, combine the soups, water and herbs de provence. Whisk to combine. Turn the heat down to low and add the soup mixture to the skillet. Cover and simmer, stirring occassionally, until chicken is done, about 20 minutes. Remove from heat. Take the chicken out of the skillet and set aside to cool enough to handle it. While the chicken is cooling. Cook the frozen veggies according to package directions. Drain. Add to the skillet. Stir. Once the chicken has cooled enough to touch, remove and discard the skin and the bones. Cut the chicken in chunks. Add back to the skillet. Stir. Serve over homemade Buttermilk Biscuits. Sprinkle with a fresh parsley to garnish. Note: Now, you could use canned or frozen biscuits and I won't tell but homemade taste better. Sorry for the lack of step by step pictures of this inside out, easy chicken pot pie. I didn't realize my camera battery was dead when I started cooking. Check out my Facebook page for upcoming recipe! Copyright © 2008-2015 Mama's Southern Cooking.com All Rights Reserved Don't just build a website...Build a website that SELLS!